Klaus Holzkamp (1927-1995) was the founder of German Critical Psychology, working on the fundamental renewal of academic psychology. His ideas inspired generations of young scholars dissatisfied with the socio-political function of psychology and the human sciences. Although his approach has been discussed internationally, much of his work has not previously been available in English. This selection of Holzkamp’s writings provides an introduction to his psychology from the standpoint of the subject. 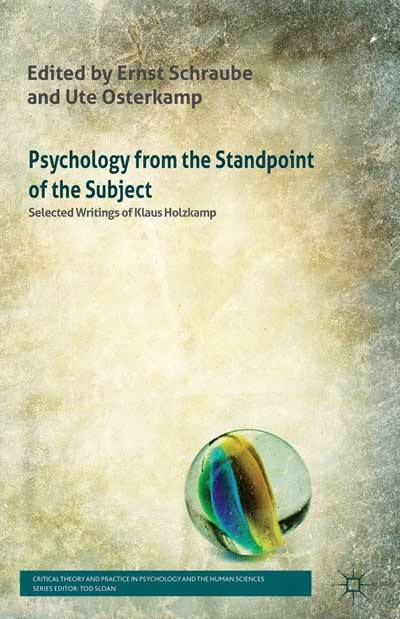 In Holzkamp’s approach, the object of psychological research is not the individual, but the world as it is experienced and lived by the individuals in their everyday lives. This requires a change of perspective to recognize the function that the common individualistic reduction of human subjectivity and agency has for maintaining established power-relations. The concepts of social self-understanding and generalized agency play a key role in a psychology from the subjects‘ standpoint, as alternatives to subjection can only be realized together, and in accord, with others. Dieser Eintrag wurde veröffentlicht in Neuerscheinungen und getaggt als Osterkamp, Ute, Schraube, Ernst. Fügen Sie den permalink zu Ihren Favoriten hinzu.